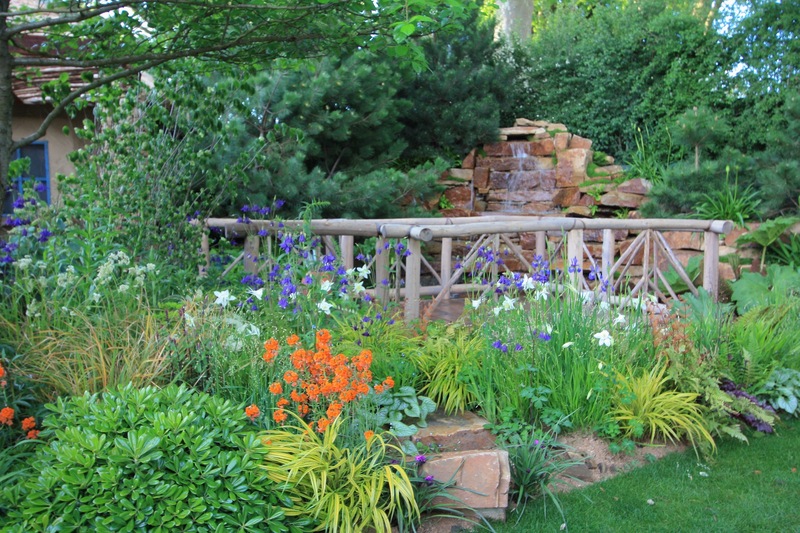 For the second year running, Matthew Keightley has won the Chelsea People’s Choice Show Garden award. Pretty good, eh? So why is it that the judges only (like, most of us would be fussy) awarded him a silver-gilt, for the second year running? Seven gold medals in 2015 and yet a silver-gilt won the show. And looking back over the last five years, not once did the judges’ Best in Show win the People’s Choice, with three occasions where silver-gilt picked it up. Being the curious sort that I am, I can’t help wondering why? Are the judges just wrong? Or could it be that the public simply prefer design with a few rough edges? Or just maybe is it something about the timing of the awards that skews the results? Would the results be the same if people voted before the judges’ decisions were announced? It makes me wonder which is the most meaningful award? Surely you can’t negate the views of thousands? Judges may have the utmost skill in their field, but are they more right than everyone else put together? It got me thinking about my own view of the garden. 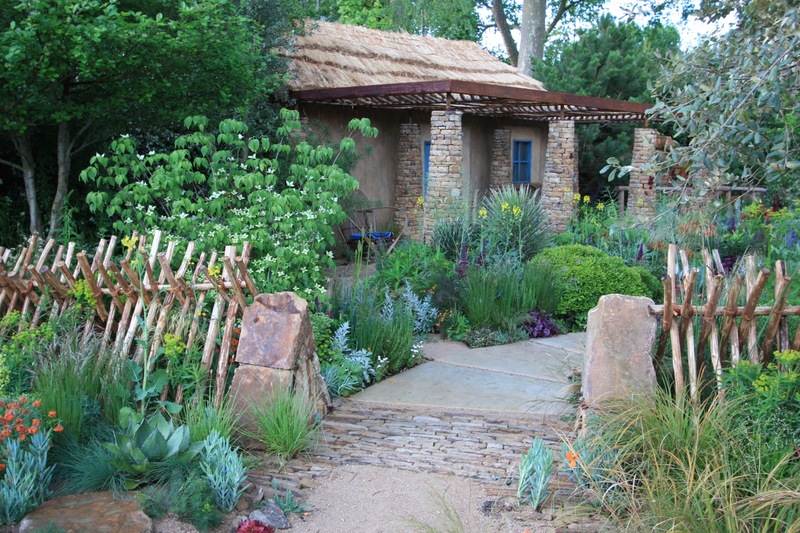 In the run up to the show, ‘Sentebale – Hope In Vulnerability’ (long for HIV), representing Prince Harry’s children’s charity in Lesotho, had been one of the gardens I was most excited to watch for. 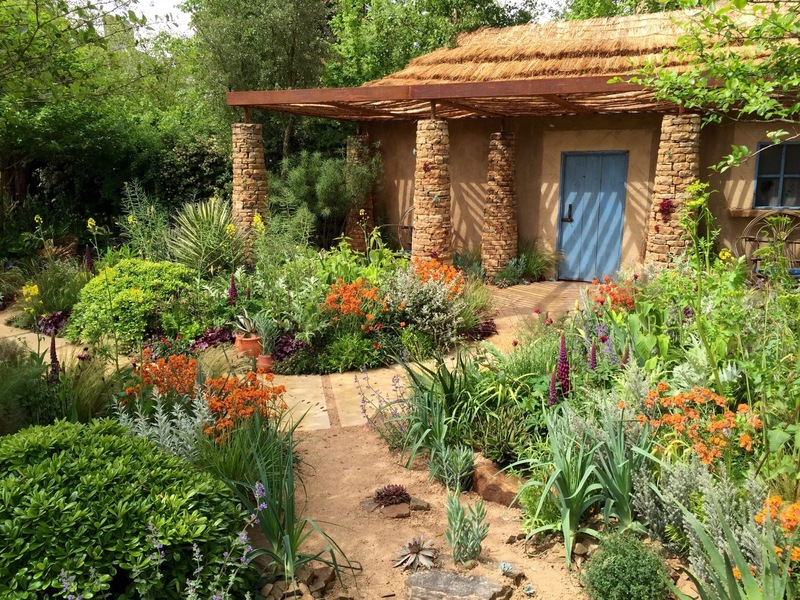 I adored Matthew Keightley’s 2014 Chelsea garden, I love gardens with a true sense of place and I love something a little creative and different. It had it all. And yet when I saw it, my heart sank. It was nice, but it didn’t quite make me dance around the room as I had expected. My initial thought was that it too muddled. The brief was to evoke the landscape of Lesotho and represent the new children’s centre that opens there later this year. But I thought the garden was part very African, part very Chelsea. It didn’t have that sense of place I was looking for. Neither one nor the other: the worse of both worlds. As I studied the garden in more detail, I saw that it is designed in three sections. 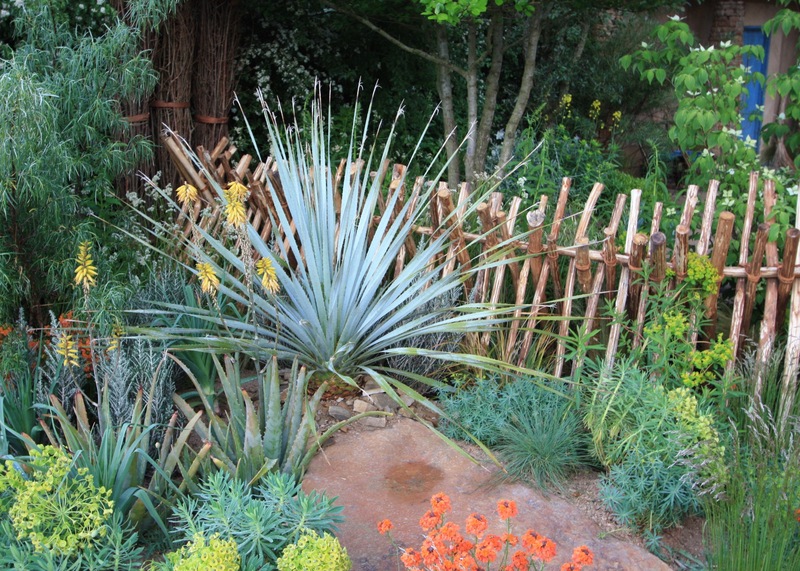 The dry, arid section, with Agave and Festuca glauca. The wet section, representing the mountains of Lesotho with lush Agapanthus surrounding a generous waterscape. In the middle, well, something else. 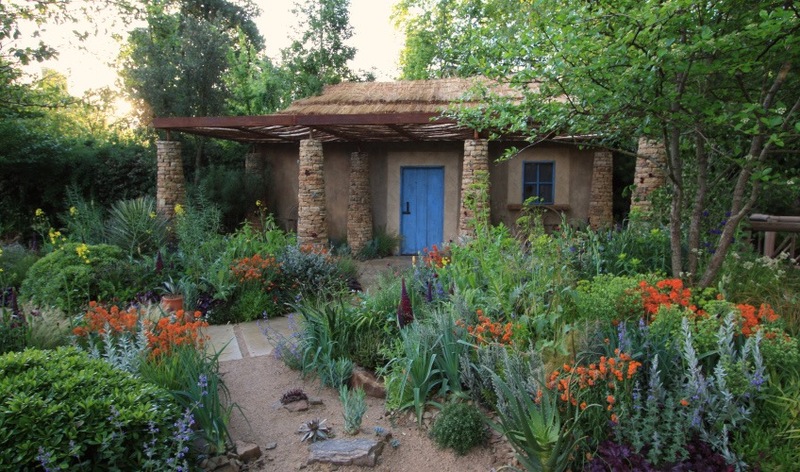 Prince Harry referred to part of the garden as ‘taking you on a journey of what [Lesotho] could be like’; Robin Lane Fox was told that the fennel and lupins were evocative of Lesotho’s productive gardens; The Frustrated Gardener’s blog describes a ‘colourful garden compound’ in the central section. But to me, it looks like the ‘odd bit out in the middle’, where they thought they’d better have a section of typical Chelsea. It just didn’t hang together. It has been said that judges frown upon gardens that are overly themed. I’m generally not a big ‘themed garden’ fan myself, but equally I don’t think all themed gardens are bad gardens: they can have a tremendous sense of place. 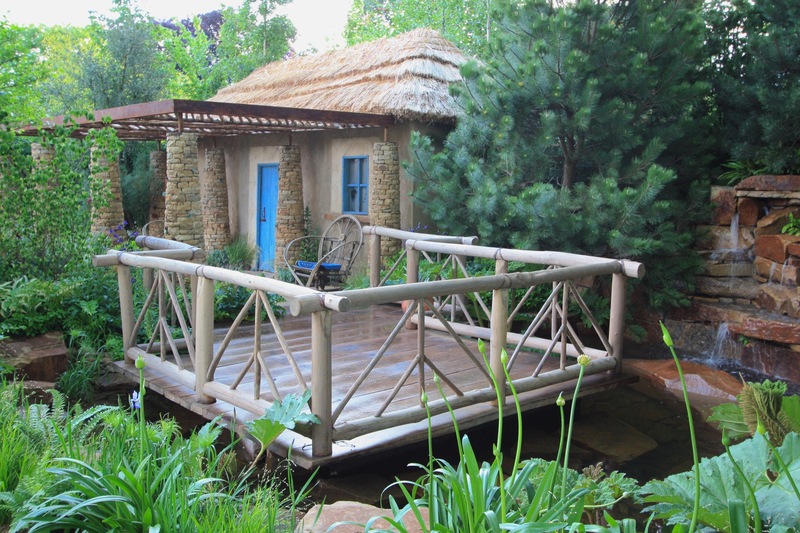 This was a show garden designed to represent and take creative inspiration from a charity in Africa; by definition show gardens are islands of creativity, they don’t need to blend in with their surroundings as most ‘real’ gardens benefit from. It seems that there was conflict: wanting to ‘do’ Africa, but not daring to go too far from the judge-loving norms; and ending up with neither one nor the other. But the public clearly loved it. The crowds here were huge and they voted for this garden with their phones as well as their feet. They loved the bright, hot colours and the playfulness of the design. They loved the peaceful waterscape with the cool running water. They loved the children’s footprints in the sawn sandstone. Prince Harry said of Matthew, ‘he’s nailed it’. So what happened with the scoring? Most say that against the set criteria, the scoring is completely fair and just. Each garden is scored individually by each judge, it is then debated, then debated some more and it is broadly thought that the outcome is robust. Of course the appropriateness of the criteria may questioned, but that’s a whole different question. I, personally, feel that silver-gilt was right and conclude that the timing element of the awards is what gave this garden the People’s Choice award. I think those who liked Dan Pearson’s garden best, of which there were many, didn’t feel so compelled to vote for the People’s Choice. After all, the garden had already proven itself with Best in Show. But for those that liked this garden, or liked Matthew Keightley, Prince Harry and/or the Sentebale charity’s aims, they wanted to make a stand and show it was worth more to them than eighth on the list. Which I think is pretty nice. It shows generosity and passion and feels like a good way of acknowledging well loved gardens that didn’t quite make the grade they might have. My hypothesis is that had the People’s Choice been voted on before the judges’ decisions were announced, Dan Pearson would have won that too. And so Chelsea draws to a close for another year. It was called the ‘Chelsea Shower Flow’ (read that slowly) by some this year, in part due to the profusion of water features but even more so due to the wet weather. As Alan Titchmarsh commented (you can just hear him say it), ‘a garden without water is like a kiss without a squeeze’ and our lovely Matthew Keightley’s good natured response to the rain on the succulents in his arid garden was, ‘I thought the garden would probably work best in the sun…but actually rain always makes natural stone look its best and it made the plantings look even more vibrant’. What a nice man he is! After all I’ve said, I feel very happy for his award for a truly beautiful garden. With thanks, again, to Dan at The Frustrated Gardener and my friend, Alex Martin, for the kind permission for the use of their photos. Well thought out as always Janna! 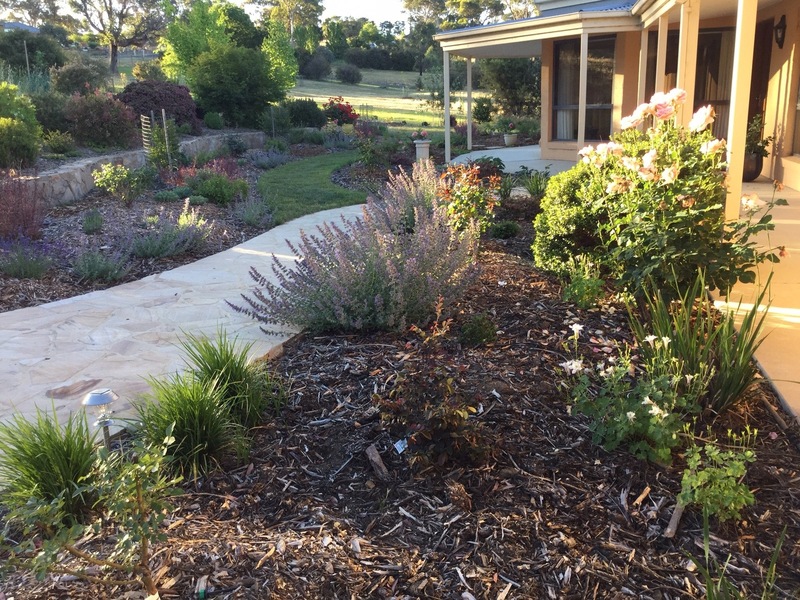 I wonder if there might be another small factor in the mix here to explain the vote – looking at this garden, it must be easier for most people to imagine how they could use ideas from it in their own back yards. You can relate to it, see how it was put together. You could go home and build a sweet chestnut fence like the one above. Much as I absolutely LOVED the brilliant Dan Pearson garden, if someone is looking for inspiration, the sheer ‘how did he do it? !’ factor might make it feel unattainable for many! I’m overwhelmed myself! We are ALL overwhelmed, I think! Good point though; taking ideas certainly explains the longer ‘dwell time’ at this garden, and then crowds make subsequent people feel, ‘it must be great’…. I’m sure you are also right that some do vote for ‘which garden gave me the most ideas’ as opposed to ‘which garden was genuinely best if I really thought about it’. Chelsea is about inspiring others though, so if it did that more than any other, why shouldn’t it win a top award? Disappointed in this one – I know what it is trying to do but it’s just too sentimental. Finally got to have a good look at all the display gardens entered this year and three or perhaps fours stood out to me: Dan Pearson’s wonderful contribution, The Home Based garden, M&G s garden and Good old Charlie Albone’s contribution – minus the pink (agreed Janna on that). Nice photos 😉 I feel both gardens created a great atmosphere and in that respect Dan and Matt were equal. The skill involved in Chatsworth was above and beyond anything I’ve seen at Chelsea, so in that respect it deserved all the awards it got. In a ‘normal’ year perhaps Sentebale’s star might have burned brighter. GREAT photos! Dan Pearson did rather take the limelight this year. I have to assume that Sentebale presented better in the flesh than in 2D as it was clearly loved by very many. 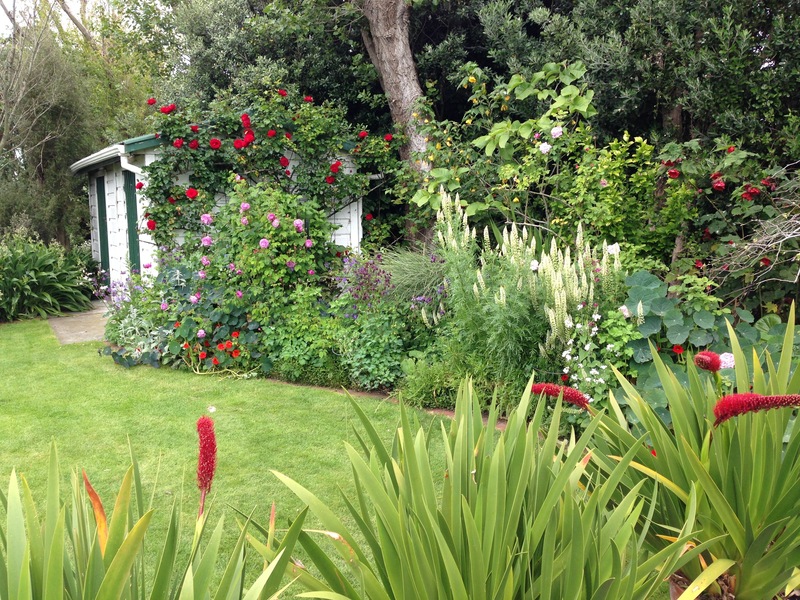 The ‘feel’ of a garden, as opposed to just the ‘look’ is so very important, after all.